Some styles are already sold out. Off-White™ launches a range of goods infused with GORE-TEX functionality. An all-black line-up of anorak, jacket, hoodie and pants are all informed by the breathable, weather-resistant membrane, and boast the graphics to prove it. 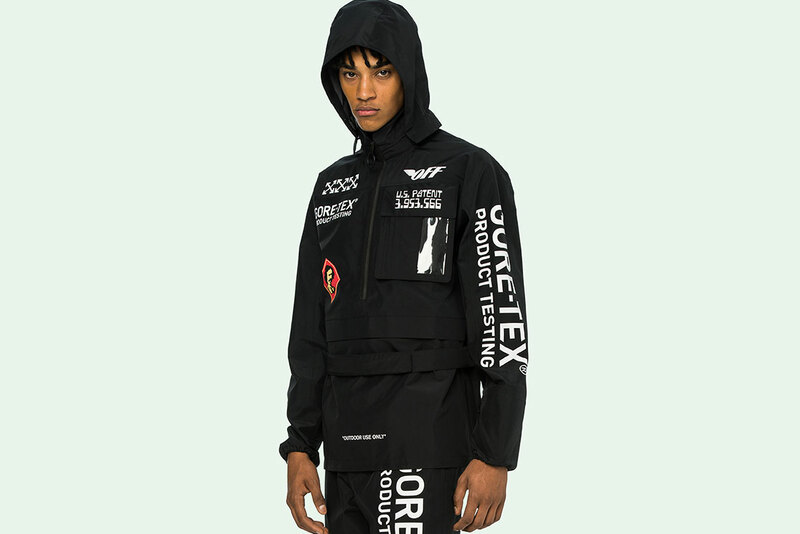 White prints appear throughout the collection, with Off-White™ and GORE-TEX branding joined by “PRODUCT TESTING” & “OUTDOOR USE ONLY” verbiage and the technology’s patent number. More logos, patent text and diagram of the membrane in action appear on the rear of each layering piece. While the hoodie and pants both sport elastic hems, the former offers adjustable hood pulls and an angled zipper; the anorak and jacket both feature zipper closure along with snap buttons and velcro fastening straps for maximum protection against the elements. Pre-order the clothes while you still can via Off-White™’s web store (labeled as “GOROTEX”) and look for them to be delivered on October 8. Exclusive Wasted Youth goods for the Harajuku opening. Available to bid now on eBay. King Push’s next project probably won’t be limited to 7 tracks. His first solo project since 2016.